Are you a potential investor seeking a reliable investment opportunity? Goldmoney is the perfect, high-yield investment opportunity for you.Goldmoney has numerous intrinsic qualities that make it a necessity for investors to hold in their portfolios. In this article, we will focus on the benefits of this opportunity, why it belongs in your portfolio as an investor and the different ways that you can invest in the gold market. Absolutely Yes!Gold has always played a vital role in the international monetary system and is still very important in the global economy today. Of all precious metals, gold is the most popular as an investment. Smart investors buy gold as a way to preserve wealth and diversify risk.To maximize your investment in the gold market, you need a reliable and professional gold-based financial institute such as Goldmoney. Gold is wonderful;you can’t own too much gold! So why is Goldmoney so beneficial? Find below, a detailed explanation of the many benefits of Goldmoney:Simplicity of Ownership and TradingThe concept of gold ownership is quite simple on the platform. As an investor, you can buy gold bullion or coins in a very simplified process. You can monitor prices easily and when it comes to selling, Goldmoney Inc. made it a very straightforward and transparent process.In summary, Gold is easy to buy and easy to sell on the platform. In addition, it has global use and can be traded everywhere worldwide.Lowest FeesGoldmoney offers the least expensive way to buy, sell, store, and take delivery of physical precious metals. It is much cheaper than ETFs and coins.100% SecuredAll client assets are segregated, fully-reserved (1:1), and securely stored in insured vaults around the world. This totally eliminates counterparty risk that exists with other forms of investments which all have potential fraud or theft risks.Dependable and ReliableYou’ll sleep better at night knowing your investment is in safe hands. Investing in Goldmoney offers a calming effect. The company is a publicly listed corporation on the TSX (XAU) and regulated by the JFSC. Financial statements are audited by a Big Four accounting firm (KPMG).Redeemable BullionUnlike many other forms of investment, Goldmoney is tactile and tangible. Owners can touch, feel, and hold it. Precious metals are redeemable in bullion bars at vaults and Goldmoney Branches, or in a selection of coins and bars that can be shipped to clients via Schiff Gold.Low RiskGoldmoney is a hugely useful asset to have as part of a balanced investment portfolio. It is a must-buy for reasons such as high liquidity, low risk, and other reasons such as:- Higher profits on long term (more profitable than bank’s low interest on investment),- Safe haven investment,- Inflation hedge (Gold rises as inflation rises. Cash devalues),- Currency swing and economic uncertainty hedge.Tax AdvantagesTax relief of up to 45% is available on gold bars as part of a pension. Goldmoney offers IRA and SIPP accounts for accumulating precious metal savings and deferring tax exposure. Goldmoney offers unique institutionalized banking services such as Prepaid Card available in plastic, 18K gold, and silver. Free gold transfers and business tools for earning in gold. Multi-currency accounts in up to nine currencies and free FX conversions.They also offer professional institutional services for family offices, corporations, and trusts that provide access to pricing, execution, and custody technology through an API.Goldmoney is the easiest way to invest in physical gold and silver bullion online whether you’re new to the investment world or you’re a professional. 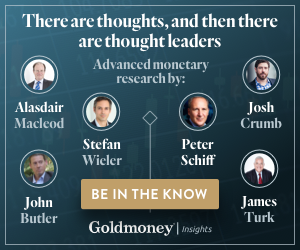 From buying physical gold to cryptocurrencies (Bitcoin), investors have several different options when it comes to investing in Goldmoney.Not only that, current clients have access to the world’s leading precious metals research, done by a team of analysts with over 180 years of combined experience navigating markets. You will receive Market Insights, Updates, Live Prices &Charts.With such amazing benefits, Goldmoney is literally a gold mine! You will get more returns on your investment using this secured platform. Still contemplating? Opening a Holding with Goldmoney will convince you! This article by Stephen Collie was previously published on Steve Collie Marketing. Goldmoney has numerous intrinsic qualities that make it a necessity for investors to hold in their portfolios. In this article, we will focus on the benefits of this opportunity, why it belongs in your portfolio as an investor and the different ways that you can invest in the gold market. The concept of gold ownership is quite simple on the platform. As an investor, you can buy gold bullion or coins in a very simplified process. You can monitor prices easily and when it comes to selling, Goldmoney Inc. made it a very straightforward and transparent process. In summary, Gold is easy to buy and easy to sell on the platform. In addition, it has global use and can be traded everywhere worldwide. You’ll sleep better at night knowing your investment is in safe hands. Investing in Goldmoney offers a calming effect. The company is a publicly listed corporation on the TSX (XAU) and regulated by the JFSC. Financial statements are audited by a Big Four accounting firm (KPMG). Not only that, current clients have access to the world’s leading precious metals research, done by a team of analysts with over 180 years of combined experience navigating markets. You will receive Market Insights, Updates, Live Prices & Charts.